Over the weekend of the 2-3 December, the 12′ Skiffs raced their Interdominion Trials to gain selection to the main event in January 2018. Nine boats raced and the regatta was won by Chris Skinner and Chris Holland sailing Fraudster but they only secured the win after countback after finishing on equal 13 points with Ugly Stick sailed by Simon Ganley and Oliver Scott-Mackie. Skinner, who has spent the last 6 months building Fraudster, said that it was a great weekend racing the longer Interdominion courses. 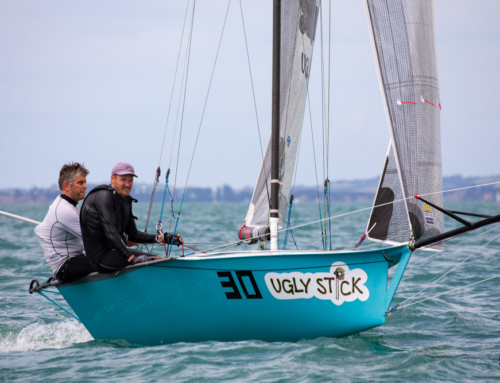 Simon Ganley, skipper of Ugly Stick, was equally happy with the weekend of racing. “It was champagne big rig racing with some very close finishes throughout the weekend,” said Ganley. “We will let Fraudster have this one, but we will get them this weekend,” he continued. The 12′ Skiff Interdominion Trials have wrapped up, but the weekend also contributes towards the overall Auckland Skiff Championship result with another six races planned for the weekend of the 9-10 December. 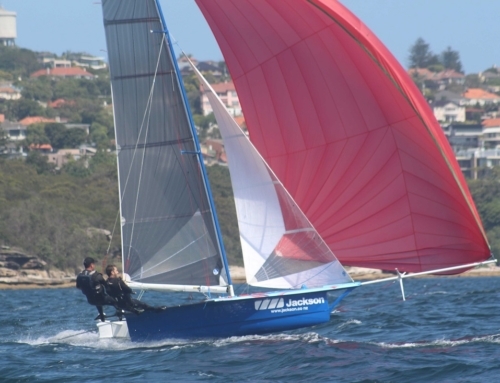 The fleet will then head out for numerous training sessions before the main event, the 58th 12′ Skiff Interdominions, hosted by Royal Akarana Yacht Club from the 6th to 13th January. “We will be spending a lot of time on the Interdoms race course in the build up the event in January. Looking forward to taking on the Aussies on our home turf,” said Skinner.